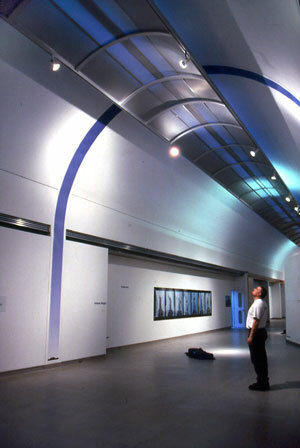 A 60-foot long photographic print depicting a 180-degree expanse of sky. At the base of each end of the image appears a large truck hurtling down a multi-lane highway. The panorama recreates the desire for a unifying field of representative vision---a gaze that seeks to reconstruct a setting. Here, a limit is acknowledged: the view is turned on its side and we see 15.6 metres of sky and only a few centimetres of recognizable land while two trucks pass by. The immensity of what purports to be represented is undermined by the “tinyness” of the trucks. 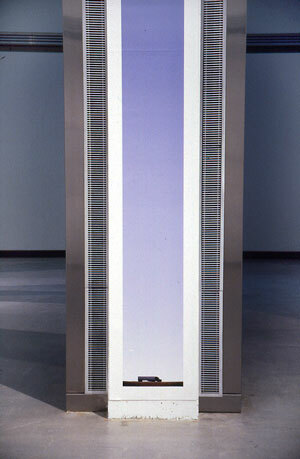 We shift our assessment of scale from that of the image to that of the gallery’s architecture and back again in an effort to regain our understanding of the illusory--Intimate immensity above a protracted moment of global commerce.